Andaz Apna Apna (translation: Everyone has their own style) is a 1994 Indian slapstick comedy film directed by Rajkumar Santoshi, starring Aamir Khan, Salman Khan, Karisma Kapoor, Raveena Tandon, Paresh Rawal and Shakti Kapoor in the lead roles. Mehmood, Govinda and Juhi Chawla make guest appearances. The film was released on 4 November 1994. The story of this movie is inspired from telugu movie 'Allullu Vasthunnaru'(1984). Again, the plot elements of this movie were later used in other language movies such as Ullathai Allitha (1996), Veedevadandi Babu (1997) and Galate Aliyandru (2000), though none being a frame to frame remake. The film was a failure at the box office but has since emerged as a cult film over the years. The lexicon of the movie has become part of every day language. Amar (Aamir Khan) and Prem (Salman Khan) are two daydreamers with a common aim: getting rich by marrying a rich heiress, Raveena Bajaj (Raveena Tandon), daughter of Ram Gopal Bajaj (Paresh Rawal). The guys run into each other on a bus and soon realise that they have a common goal. The two then fail at various attempts to woo the lady. Meanwhile, they decide to insinuate themselves in her house. Amar pretends to be a guy who has lost his memory after getting hit by Raveena, while Prem pretends to be a doctor. The boys don't know that Raveena's secretary Karishma (Karisma Kapoor) is the real Raveena and Raveena's actual name is Karishma. Raveena switched her identity because she wanted to find a boy who will love her, not her money. Nobody is aware that Ram Gopal has a twin brother called Shyam Gopal Bajaj, aka Teja. Teja is a criminal who has taken lots of money from Crime Master Gogo (Shakti Kapoor). Teja hopes to land the riches himself by kidnapping his brother and posing as Ram. He has also planted his cronies Robert (Viju Khote) and Bhalla (Shehzad Khan) in the household. Ram arrives in India and Teja plans to steal Ram's money converted in diamonds. Here, Ram sees through the real nature of Amar, and Prem thus declining Raveena's marriage to either of them. The duo plan to fake a kidnapping where they will heroically "rescue" Ram. Unknown to them, Teja has planned to kidnap Ram as well. Teja succeeds in having Ram kidnapped. The boys go to rescue Ram, but Teja makes them believe that he is Ram and finally enters Ram's household. Initially, nobody suspects a thing, but the girls soon smell a rat. The boys have discovered the real identities of the girls. Prem has fallen for real Raveena, while Amar has fallen for real Karishma. The girls tell their suspicions to the boys. The boys tail Teja and soon find out the truth. Here, Ram tricks Teja and escapes the prison. However, the boys mistake him for Teja, resulting in Ram being imprisoned again – with Amar and Prem. However, Amar and Prem succeed in convincing Robert and Bhalla that Ram is actually Teja. The boys, along with Robert and Bhalla, stop Teja. However, Ram is kidnapped along with Raveena and Karishma. The climax takes place in Gogo's lair, where the boys try to control the situation along with Ram. In a comic standoff, the real motive of each villain is revealed. However, due to the smartness of the boys, police raid Gogo's lair, thus rounding up all the criminals. Ram finally decides to let Karishma and Raveena marry Prem and Amar. In 2013, there were rumours that former United Nations diplomat and member of Parliament Shashi Tharoor made a guest appearance in the movie. Tharoor clarified on Twitter that the person in question was not him. The film's producer Vinay Sinha approached writer-director Rajkumar Santoshi with the idea of making a film with Salman Khan. Having made two back-to-back serious films like Ghayal (1990) and Damini – Lightning (1993), Santoshi wanted to make a comedy film. It was then decided that he would script a funny film about two warring buddies, the human versions of Tom and Jerry. He then decided to bring Salman Khan to the party followed by then relative newcomers Karishma Kapoor and Raveena Tandon as the female leads along with Paresh Rawal in a double role. Santoshi started writing the script after the casting. Films unit decided that Salman Khan wanted more screen space than the other, actors. Tinnu Anand was offered the role of the villain "Gogo", but could not do it because of date issues. It eventually went to Shakti Kapoor. The Muhurat shot was done by cricketer Sachin Tendulkar. Aamir Khan has joined in a crucial role. Andaz Apna Apna took three years in making, and several scenes were improvised by the actors on set. The film hit at box-office; it was able to recover its budget cost mainly due to business from big cities, but did not turn out to be a massive hit contrary to everyone's expectation. It earned an excess of ₹5 crore nett in India. Its total domestic gross was ₹8.18 crore, and its overseas gross was $150,000, bringing its worldwide gross to ₹8.653 crore (equivalent to ₹43 crore or US$5.9 million in 2018). It was the year's 17th highest-grossing Indian film. The lack of publicity and tough competition from other films of that year including Laadla, Mohra, Hum Aapke Hain Koun..!, Krantiveer and 1942: A Love Story were reasons for its average business. All of these films were very strong in their box office presence and Andaz Apna Apna, belonging to a different genre, could not compete well. It has however, in subsequent years, achieved a cult classic status among Hindi audiences. Several dialogues from this film like "Teja main hu. Mark Idhar hai", "Crime Master Gogo, Mogambo ka Bhatija", "Do dost ek cup me chay piyenge" etc., are popular. It went on to be an inspiration for the plot element of the Tamil movie Ullathai Allitha, the Telugu movie Veedevadandi Babu and the Kannada movie Galate Aliyandru. It was also reported that the climax of 1973 movie Victoria No. 203, including the set and the action, was shot-to-shot copied in this movie. While reviewing Grand Masti in 2013, critic Khalid Mohamed described Andaz Apna Apna in the "collection of excellent comedies" from Hindi cinema. Film critic Raja Sen called it a "cornball classic" and "one of the greatest comedies in recent times." In 2014, comedian Aditi Mittal wrote: "Writing about Andaz Apna Apna, I have realised, is like writing about mother’s love. Everyone has their own version of how it affects them, what lines they remember the most." The film has four songs composed by Tushar Bhatia with lyrics by Majrooh Sultanpuri. * Song was not included in the movie, though it appeared on the soundtrack album. The plot elements of the movie were used in many languages as Ullathai Allitha (1996), Veedevadandi Babu (1997) and Galate Aliyandru (2000). Andaz Naya Naya is a Bollywood animated 3D film, which is an official remake of Andaz Apna Apna, but it has been shelved due to some reason. Producer Sidharth Jain began to question if the film would do any good at the box office because Indian animated films do not get good market, so Jain shelved the film after being 35% done. ^ "Andaz Apna Apna: 20 hilarious dialogues". India Today. 11 April 2014. Retrieved 1 December 2018. ^ "Andaz Apna Apna clocks 23 years, here are some memorable dialogues from your favourite characters". India TV. 11 April 2017. Retrieved 1 December 2018. ^ a b c "Andaz Apna Apna". Box Office India. Archived from the original on 21 July 2016. Retrieved 21 July 2016. ^ Dubey, Bharati (5 December 2013). "Fake Shashi Tharoor was a part of Andaz Apna Apna?". Mumbai Mirror. Times of India. Retrieved 20 March 2019. ^ a b c "Rajkumar Santoshi: Didn't know Andaz Apna Apna would be such a laugh riot". NDTV. 11 April 2014. Retrieved 12 April 2014. ^ a b c Chintamani, Gautam (12 April 2014). "From flop to cult film: The journey of Andaz Apna Apna". Firstpost. Retrieved 11 January 2016. ^ a b c Srivastava, Abhishek (19 April 2014). "The Hittest Funniest Flop Show". Tehelka. Retrieved 11 January 2016. ^ a b c "Andaz Apna Apna: Lesser known facts". The Times of India. ^ "100 Filmfare Days: 74- Andaz Apna Apna". Filmfare. 7 July 2014. Retrieved 11 January 2016. ^ "Top Worldwide Grossers 1994". Box Office India. Retrieved 10 November 2018. ^ Singh, Prashant (8 March 2014). "Andaz Apna Apna didn't get a fair chance: Aamir Khan". Hindustan Times. Retrieved 12 January 2016. ^ "Andaz Apna Apna: 20 hilarious dialogues". India Today. 11 April 2014. Retrieved 12 January 2016. ^ "Andaz Apna Apna: 20 iconic dialogues from the Salman Khan, Aamir Khan-starrer". Hindustan Times. 11 April 2015. Retrieved 12 January 2016. ^ Bhattacharya, Roshmila (13 October 2015). "In focus: Dadamoni, Pran and fun times". Mumbai Mirror. Retrieved 22 July 2016. ^ Mohamed, Khalid (27 September 2013). "In Bad Taste". Khaleej Times. Retrieved 12 January 2016. ^ Sen, Raja (23 December 2005). "Weekend Watch: Andaz Apna Apna". Rediff.com. Retrieved 12 January 2016. ^ Mittal, Aditi (6 April 2014). "To Us, Our Own". The Indian Express. Retrieved 12 January 2016. 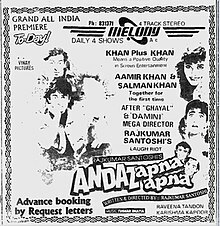 ^ "Andaz Apna Apna (Original Motion Picture Soundtrack)". iTunes. ^ "Salman Khan to lend voice for Andaz Naya Naya". Hindustan Times. Retrieved 12 January 2013. ^ "Andaz Naya Naya news". Koimoi.